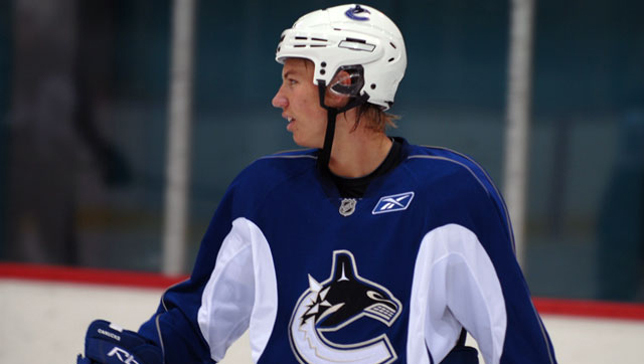 March 2016 – The Vancouver Canucks have signed Anton Rodin to a one-year, one-way contract worth $950,000. It is not a Entry Level Contract and as a result he would need to clear waivers to join the Canucks this year. He will begin his NHL career in the 2016-17 season. Rodin received the "Golden Helmet Award" as the Swedish Hockey League Most Valuable Player Award. Rodin has previously played two seasons in North America in the AHL with the Chicago Wolves. November 2015 – Highly touted virtually his entire life, Anton Rodin's name is well known across his homeland. While slightly undersized, Rodin plays a hard nosed game. He dishes it out, but often takes a beating to make plays. The thing about him is, he doesn't mind one bit. Puck hungry, Rodin uses a combination of slick moves and smart decisions to create plays all over the ice, thriving in the offensive zone. His smarts allow him to break down defensive coverage in tight spots, leading to scoring opportunities for himself and his teammates. His speed and skating is high-end, but his ability to execute at this speed is what sets him apart from his peers. After going with American scorer Jordan Schroeder in the first round, the Canucks decided take a chance on the talented Swede in the second round. Selecting him 53rd overall right between Richard Panik and Eric Gelinas during the 2009 NHL Entry Draft. After a couple of years toiling in the Swedish Hockey League, Rodin came over to learn the North American game. He spent 2011-12 and 2012-13 skating for the Chicago Wolves (AHL), only managing to score 41 points over 111 contests. He potted 10 goals and 17 assists in 62 games (minus-5), followed up by four and 10 in 49 with a team-worst among forwards and second overall, minus-11 rating. Returning home for the last three seasons, we have seen the 25-year-old steadily improve while producing points in the SHL, scoring 35 points in 47 games (12-23) and 40 in 54 (19-21) respectively. This year, Rodin has evolved to a whole other level. Scoring 10 goals in his first 19 games Is impressive, but add 15 assists and his 1.31 PPG pace indicates he may be ready to come back to North America sooner than later. This time straight to the NHL. A speedy, shifty winger who has piled up points overseas but needs to translate to the smaller ice and more physical North American game. Anton Rodin scores in 2016 NHL pre-season.